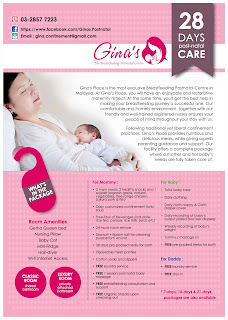 I have been helping new mommies overcome their breastfeeding challenges since 2003. And it's indeed very frustrating that most of these new mommies’ desire to fully breastfeed their babies are thwarted by confinement ladies or the grandparents who are neither knowledgeable nor supportive of breastfeeding. I used to visit new mothers in their homes. Most of the times, when I was with the mother and baby, they would be able to latch on beautifully. I would be able to help mommy identify a good latch, whether baby is really drinking or just pacifying, and to judge when baby has enough. But when I leave, they would back to square one. Baby cries and the CL or grandma will start making negative comments that baby is still hungry and pressure the mother to give baby a bottle of formula milk! How I wish I could whisk this parents away from all these negativity and provide them with an environment where the new Mommy and Daddy would receive not only positive vibes and encouragement, but correct information in making breastfeeding successful! I toyed with this idea for a few years, and finally in 2012, with the support of a few good friends, I set up a breastfeeding friendly confinement centre. With the experiences gained from running this centre, I moved on to offer better and upgraded services at Gina’s Place. Initially I wanted to hire experienced confinement ladies. After interviewing more than 20 of them, I gave up hope of ever finding one who’s willing to be breastfeeding friendly. ALL of them believe that not all mothers will have milk and supplementing with formula milk is necessary. I decided that a registered nurse would serve the same purpose as a confinement lady, ie taking care of a newborn and helping the new mother. I know that nurses do not receive much lactation instructions in nursing school, but that’s ok. During the interviewing process, I stressed the importance of the nurses embracing the message of ‘exclusive breastfeeding’. Only nurses who are willing to learn would be considered for the job. A dedicated chef prepares the menu at Gina’s Place. Together, we spent hours going through confinement recipes books and websites, and talking to TCM practitioners on the ‘can eat’ and ‘cannot eat’ food. Most of them confirmed my belief that moderation is key when it comes to consuming food during the confinement period. We put in a lot of effort in planning the menu to ensure that it promotes healthy lactation and recuperation of the mother. We are willing to go the distance in ensuring the quality of our raw materials ie healthy free-range chickens, An Xin Pork, organic grains and sulfite-free herbs. At Gina’s Place we have one guarantee. As long as the mother is willing, she will get the best help in making her breastfeedng journey a successful one. Gina's Place. Simple theme. Powered by Blogger.